It’s the Holidays, and for any parent that means one thing above all else: Stress. As Hannukkah passes and Christmas gets into full swing, it’s hard to find time for just you and you partner. Sure you may be able to drop them off at Nana and PopPop’s at some point, but your time is filled with the rushing around of buying gifts. While you may be able to turn that into a good time, you still gotta get that Date Night in some how. The Date Night is quite possibly the most important tool in a parents’ arsenal. It’s one of those things that needs to happen regularly so you both can decompress. This holiday season, my friends at Restaurant.com have a little something for you. The holiday season ushers in festive foods, décor, and winter’s highly anticipated movies of 2015! 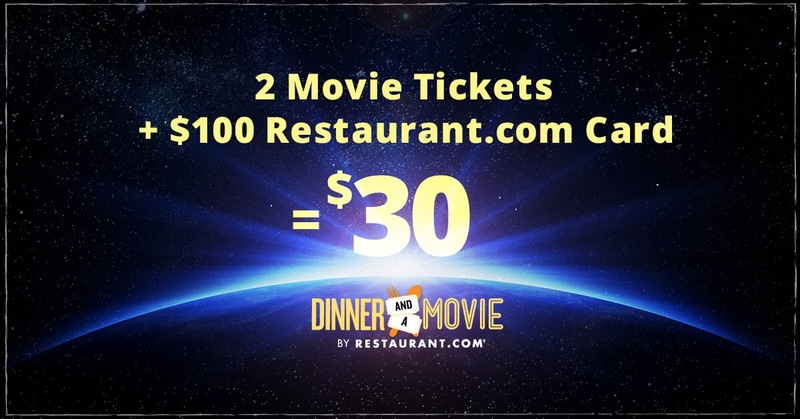 Explore the galaxy, sing with the Chipmunks or solve a Sherlock mystery—and dine out with Special by Restaurant.com’s Dinner & a Movie deal. Now through December 20 for $30, you’ll receive two tickets PLUS a $100 Restaurant.com eGift card to redeem for a star-rated restaurant. Spend family time discovering the perfect table and flick. Use your movie tickets to see any winter blockbuster hit here. Hurry – this offer ends Sunday, December 20 at 11:59 pm CT or when it’s sold out. Restaurant.com and Specials by Restaurant.com make great gifts for everyone on your wish list. Connect with Restaurant.com on Facebook, Twitter, Instagram, and Pinterest and never miss their next great deal!